When The Ventures returned to Japan in January 1965, they had become household names. The impact of their music on Japanese teenagers was enormous. 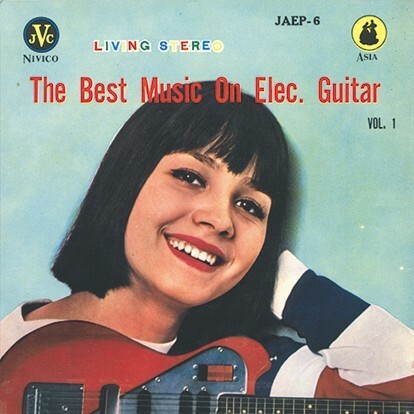 Unhindered by the language barriers inherent in performing American or British vocal music, hundreds of Eleki (Japanese English for “electric”, as in electric guitars) combos sprung up all over the country. Domestic guitar manufacturers such as Guya couldn’t keep up with the demand, so companies usually associated with other industries such as Victor (better known as JVC in the U.S.) began producing electric guitars. In 1965, 760,000 guitars were made in Japan, a record that has yet to be broken. All I can tell you about The Spacemen is that they recorded a handful of singles (most of which you can view here), and at least three albums (one of which you can listen to here). If you any information about the band, please contact me. Catalog number JAEP-6 on JVC Nivico. No release date listed. In 1962, The Ventures made the first of what would be many tours of Japan and the Far East. While the shows attracted very little media attention, many had already been exposed to this new reverb-drenched instrumental music through imported records and overseas radio broadcasts, and some of these fans formed their own bands that would become the genesis for a new trend in music. Progenitors of this new sound were tossing out their acoustic guitars in favor of more powerful electric ones, which prompted the name “eleki”, taken from the Japanese for “electric guitar”. When The Ventures returned back to Japan in 1965, a far different scene awaited them. By this time “eleki” was all the rage. Many established groups had by this time given up playing rockabilly, country, and even jazz to switch over to “eleki”, and high school kids across the nation were rushing out to buy electric guitars and jump on the “eleki” bandwagon, demand for these guitars far outstripping domestic supply for several years running. In addition to the radio and concerts, there were at least four television programs dedicated exclusively to “eleki” music including Eleki Tournament, Exciting Show, Eleki Tournament Show, and New Eleki Sounds Jumping into the World, and the establishment had begun to cast a wary eye on the “disturbing” trend. This had happened in the past with the rockabilly boom of the 50s, and would happen again with the Group Sounds bands later in the 60s, but regardless of the pressure, “eleki” continued to flourish. Takeshi “Terry” Terauchi started out as a sideman in Jimmy Tokita & the Mountain Playboys, a country & western band. In 1962, he formed his first eleki band, the Blue Jeans, with whom he remained until 1966. 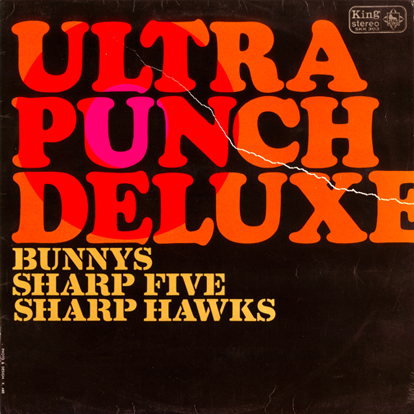 He then formed a new group, the Bunnys, who recorded the eleki classic “Test Driver”. 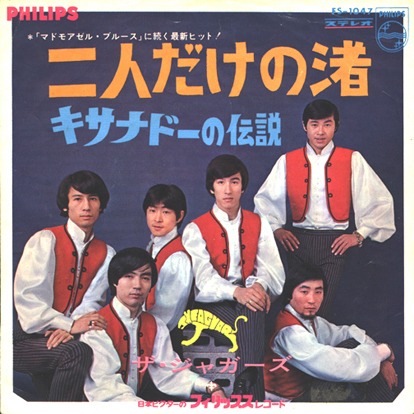 After the Bunnys disbanded in the fall of 1968, Terauchi formed a new version of the Blue Jeans, called Takeshi Terauchi & the Blue Jeans (to distinguish them from the original Blue Jeans, who continued recording and performing after Terauchi’s departure, and even opened for The Beatles at their 1966 Japanese concerts). Terauchi’s style is very Ventures-influenced, but much faster and more frantic, with a heavy picking style and liberal use of his Mosrite’s whammy bar. Later on, Terauchi experimented with adapting flamenco and other western styles (as well as Japanese musical forms such as enka) to eleki, with mixed results. Terauchi is probably Japan’s first guitar hero, and he has continued recording and touring through the years with new groups of Blue Jeans, and claim to have recorded and released over 300 albums to date. Where as “Terry” Terauchi is still well known in Japan, and throughout the rest of the world, not many people know about Munetaka Inoue & His Sharp Five. The leader of the band was Munetaka Inoue on drums and percussion, with guitarists Nobuhiro Mine and Hidemasa Yamauchi, bassist Masaaki Ito and Osumu Furuya on organ and keyboards. boys and a girl (who later left the band in ’65). But when the Group Sounds boom happened, they became GS, a vocal beat combo. As the story goes, they couldn’t play well, so the Sharp Five became their backing band. Thanks to John Sharp for getting this translated for me. Catalog number SKK 303 on King Records of Japan, released 1967. In June 1966, the Beatles visited Japan to perform a series of concerts at Tokyo‘s legendary Budokan Hall. Their visit created such national excitement among teenagers that almost overnight there was a dramatic shift in the way young musicians formed groups, played their instruments and thought about fashion and style. This new wave of 1960s Japanese rock groups was called Group Sounds—or GS for short. The term GS was purportedly coined when Jackey Yoshikawa and the Blue Comets were guests on Yuzo Kayama‘s TV show. Kayama started teasing Yoshikawa about his poor English pronunciation of “Lock ‘n’ Lorr.” Yoshikawa admitted that because of the two R’s and two L’s, “Rock ‘n’ Roll” is difficult for Japanese people to pronounce correctly. Yoshikawa then challenged Kayama to come up with an English term that Japanese people could easily pronounce. Kayama thought for a moment and suggested, “Why not call “Rock ‘n’ Roll” the “Group Sounds?” Within days the media and fans all over Japan began using the new expression. The Spiders first formed in 1961 by Shochi Tanabe, originally playing mostly country music, but basically serving as a backing band to singers and playing whatever the gig called for. 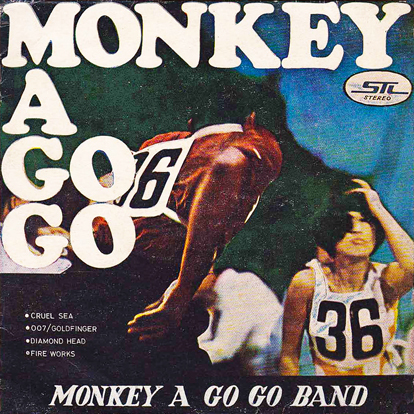 The GS version slowly came into being, the final link being the addition of teenager Jun Inoue on vocals in 1964, just as the British Invasion was hitting. Early on they recorded some cover versions of instrumental hits like “Wipe Out”, which were in vogue at the time, although they were not major hits. Soon however their sound was more along the lines of the Rolling Stones, Beatles, Animals and the Kinks, which is to say R&B influenced rock, and in fact the band did a fair number of covers of UK rock songs and R&B. Amongst the things that set the Spiders apart from other GS bands was that their style was a bit more frenzied, and they often danced and clowned around while playing. The Spiders became the premiere GS band, and were called on often to open for visiting foreign bands, including the Animals, the Astronauts, Beach Boys, and the Ventures. In 1966 the Spiders released their debut Album No.1, which was all original material. Later the same year they released Album No. 2 which was all covers. Both were well received. The Spiders were Masaaki Sakai on vocals and flute, Hiroshi “Monsieur” Kamayastu on guitar and vocals, Takayuki Inoue on guitar, Mitsuru Kato on bass, Shochi Tanabe on drums, and Katsuo Ohno on keyboards and steel guitar. Like many if the UK groups the Spiders usually wore matching suits. And inspired by the Beatles, the Spiders made four Help! like movies – Wild Scheme A-Go-Go (1967), Go Forward! !, Big Commotion! and The Road To Bali (all in 1968). Some of these movies have been released in other countries, sometimes with different titles. The band also made attempts at international markets, releasing records in many major markets and playing dates in the States and Europe, including an appearance on British TV show Ready Steady Go! and shows in Paris. The band had little impact overseas, but continued on in Japan until 1971. Catalog number FS-1030 Philips Japan. No release date listed. The Jaguars were from Japan. After The Beatles toured Japan in 1966, Japanese bands started playing music with vocals. Previously, The Ventures had been the biggest band in Japan, so instrumental music was more common. The new style was called the “Group Sounds” or simply G.S., and had its peak from 1967-1968 with hundreds of professional bands that included The Golden Cups, The Mops, The Spiders, The Tempters and The Tigers. Apparently wearing matching outfits was a requirment to be in a band at that time. Beside playing covers of The Beatles, The Monkees and the Rolling Stones songs, the groups had also their own material. Most of their perfomances were in “jazz kissa’s” (coffee shop with jazz music) and American airbases. The Jaguars also made teen-oriented feature films in the style of “Help!” and “Hold On!” Just like American and British teen-rock movies, the movies were more known for the music performances than the plot development. Catalog number ES1047 on Philips of Japan. No release date listed.